My apologies for not posting yesterday. If you’ve ever moved and sold a house, you know the special Hell I’m going through. We closed on our house yesterday and are temporarily homeless (i.e. – living with my mom for a few week while waiting to close on a property elsewhere). So when I asked if you’d like a giveaway of Lamb Lung Puffs or the newest treat from Jones Natural Chews, in the long run it didn’t matter. I haven’t had time for a photo shoot with the new treats. You’ll have an opportunity to win them in two weeks! Today we recycle a Lamb Lung Puffs giveaway (still one of my favorite treats! ), and your dog will still smile. Treat your dog to happiness. Lamb Lung Puffs remind me of dog divinity. Smallish, light like air, a crisp, melt in your mouth quality, but dry. Except they look like little steaks, complete with grill marks. The tender, tasty Lamb Lung Puff is a delectable delight for any dog. And dogs LOVE them. LOVE. I kid you not. Are Lamb Lung Puffs on your dog’s wish list? They should be! Leave a comment for the chance to win a bag in today’s giveaway! What Exactly are Lamb Lung Puffs? Getting your dog a lung is like getting your dog a lung full of air. It’s light and tasty, made only from the best USA lamb lungs. Naturally baked for flawlessness. Sure, Lamb Lung Puffs is a weird name for a treat. Because it’s so honest about what the treat is. But does your dog care about the name? It does not. I promise. Your dog only cares about the treat. The yummy NOM NOM NOM treat. And today we’re giving away this treat, or another lamb treat. Which other lamb treat? I’m so glad you asked. Or Choose the Lamb Femur Bone! 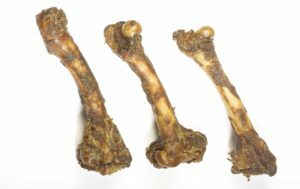 Our Lamb Femur is allergy friendly and splendid for small to medium dogs that are non-aggressive chewers. Dipped in natural liquid smoke and having meaty pieces left on the bone makes for one luscious treat. It happens to be a whole USA lamb femur bone, with knuckles on each end, from the hind leg. Doesn’t that sound scrumptious? If you’re a little dog it does. Mmm. My dogs would probably like this femur bone, since they’re delicate chewers, but it’s definitely not for a dog with strong jaws and aggressive chewing habits. Know your dog. This luscious Lamb Femur Bone is part of today’s giveaway. One lucky winner will be choosing between the Lamb Lung Puffs and the Lamb Femur Bone. If you have a large dogs, you definitely want the lung puffs. Small dogs will love the femur. We test all of our bones for splintering. We conduct pressure tests and moisture tests to ensure the best bone strength. Because of the all-natural process we put our bones through, they will not splinter any easier than a raw bone. As with any food or treat supervision is always recommended, all dogs have different chewing habits. We at Jones’ give all of our own dogs our products with confidence. Choose a bone that is the right density and size for your dog. The bone should be larger than your dog’s mouth. Pork bones and lamb bones are soft bones and are only for smaller, light chewers. Beef bones are good for most chewers. Beef shank and knee caps are the hardest bones for aggressive chewers. If large slivers or pieces are breaking off, take it away and try another type. Bones are not intended to be ingested, but chewed and gnawed on. Knuckles will be consumed and will leave a hard bone piece to gnaw. If your dog is your baby, treat it like your baby. Think toddler with an oral fixation. Know your dog. 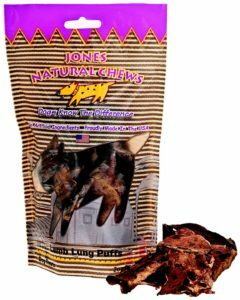 Give it the best – Jones Chews, naturally – and know what your dog can and can’t handle. And that’s it! Leave a comment if you’d like to enter the giveaway. One comment per person. Use the Rafflecopter box just below to enter. And make sure to tweet daily to increase your chances of winning!